President Mnangagwa has declared the Mugodhi shrine accident, which left 13 people dead and seven others injured in Hwedza on Monday, a State of Disaster. By yesterday, police said the death toll had risen to 14. The accident occurred after a truck carrying maize veered off the road and ran over them as they awaited transport on the roadside. Six of the 14, who are mostly the church’s members, died on the spot while the other seven were pronounced dead on arrival at Mount St Mary’s Mission Hospital. The injured were admitted at the same hospital. The accident occurred in the Chitope area where thousands of Mugodhi church members are gathered for their Passover celebrations. President Mnangagwa has since sent his condolence message to the bereaved families. “The death yesterday of worshippers at the Mugodhi Apostolic Shrine in Hwedza has cast a dark cloud on both the Easter holiday and our Independence celebrations. This freak accident which comes when the nation is still reeling from effects of the devastating Cyclone Idai, once again highlights the importance of absolute care, and ensuring roadworthy vehicles on our roads,” he said. “On behalf of the party, Zanu-PF, Government, and on my own behalf, I wish to convey my deep, heartfelt condolences to all the bereaved families, and to all members of the Mugodhi Apostolic Faith, on this tragic mishap. The President said he had since instructed the relevant Government departments to declare this tragedy a State of Disaster to pave way for Government intervention and assistance to the affected families. “As we prepare for this festive season, which is already upon us, our thoughts are will all those hospitalised following this incident, praying that their recovery is speedy and fully. “I urge all road users to exercise maximum care as they travel. In the same vein, I call upon our Zimbabwe Republic Police and related bodies to vigorously enforce our traffic laws to aim for an accident-free holiday,” President Mnangagwa said. Meanwhile police have released the names on the deceased. National police spokesperson Assistant Commissioner Paul Nyathi yesterday confirmed that one more person had died and that the death toll had risen to 14. He said they had identified all the victims and their next of kin had been informed. Police managed to release only 11 names of the victims saying they are yet to advise the next of kin of the remaining ones. The 11 names are, Paul Mupombwa (50) of Zinhanga village, Tabeth Viola Mupombwa (75) of Zinhanga village, Elite Shambamuto (5) of Shambamuto village, Egenia Mutema (80) of Mutema village, all under Chief Nyashanu. The others are Sekai Chikukwa (70) of Mutema village, Chief Nyashanu, Patricia Garwe (36) of Mukamba village (Chief Ruzanhe), Wedza, Elisha Mubaira (45) of Ndangwe village under Chief Nyashanu, Edna Chinoda (70) of Marume village under Chief Nyashanu, Buhera. Police also identified Josephine Kwaramba (60) of Chawatama school, Chief Nyashanu, Sheilla Mukamba (23) and Isaac Pamhanzi (29). Asst Comm Nyathi said the 11 who were injured and initially admitted at Mt St Mary’s Mission Hospital, two were transferred to Harare Hospital for further treatment. 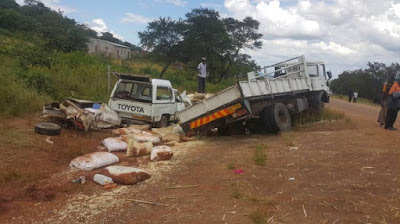 The accident occurred around 11am along Hwedza-Mutiweshiri Road when a truck carrying maize side-swiped a bus which had encroached into its lane.